Ricardo Villalobos. Discography. Music. Albums. Tracks. 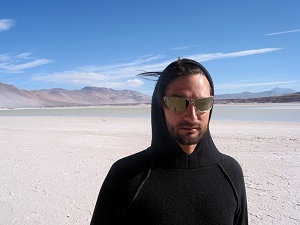 Ricardo Villalobos is a Chilean-German electronic music producer and DJ. He is well-known for his work in the minimal techno and microhouse (minimal house) genres, and is one of the most significant figures in today's minimal techno scene. Microhouse strips house music down to a more minimal and sparse aesthetic, in the same vein as tech house. Its relationship to house and tech house music can be compared to the relationship between minimal techno and the harder techno genres. Like house and techno, microhouse is built around a 4/4 time signature. A noticeable difference between microhouse and house is the replacement of typical house kick drums, hi-hats and other drum machine samples with clicks, static, glitches, and small bits of noise. Microhouse artists often experiment with different forms of sampling to achieve this effect.